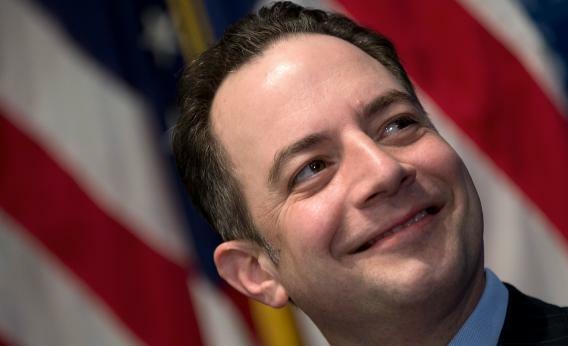 Republican debates: Reince Priebus says GOP needs more control over moderators. At a small roundtable with reporters today (more about this in a forthcoming piece), RNC Chairman Reince Priebus politely walked through the procedural changes that the GOP wants to make to its next primary. Ron Paul fans loudly protested the rules changes that made it through at the 2012 convention, which bound delegates more closely to the results of primaries—depriving Paulians of the chance to show up at local caucuses or conventions and scoop of delegates. But Priebus was foursquare behind those changes, fretful of future time-wasters like a candidate winning the Wisconsin primary then having to return with “signs and whips” to hold the delegates. Also: The party needed to cut back on debates. National Review’s Katrina Trinko asked Priebus whether some non-journalist, outside-the-box figures might be tapped to moderate. “I haven’t figured out all the concepts,” he said. “I’ve certainly talked about non-news figures involved in the debates, even having, potentially, grassroots-type debates, having Lincoln-Douglas type debates, even having traditional news as well.” The key was something that “protects our primary process, which should involve the Republican party.” Hey, Gingrich proved that the media would show up to the Lincoln-Douglas debate.